Honey as we all know, is being used in Ayurvedic and Yunani medicine for ages and is very effective. The only food item that does not deteriorate or spoil is honey. Cinnamon is a very wide and commonly used spice with a lot of health benefits. Organic cinnamon is known to reduce blood sugar and cholesterol levels. A combination of honey and cinnamon also has a lot of health benefits, some of which are mentioned below. • Heart diseases: 2 teaspoons of raw honey and half a teaspoon of cinnamon powder mixed and used as a spread everyday helps to reduce the risk of heart diseases. This combination also relieves problems with breathing and strengthens the heartbeat. • Arthritis and bladder infections: To a cup of hot water, add a mixture of 2 tablespoons of raw honey and 1 teaspoon of cinnamon powder and drink it twice a day. This helps to cure chronic arthritis too. • Cholesterol: 1 tablespoon of raw honey and 1 teaspoon of cinnamon powder in a cup of lukewarm water is found to reduce the level of cholesterol by a considerable amount. • Cold: A mixture of one quarter teaspoon of cinnamon and a tablespoon of raw honey helps reduce chronic cold, cough and sinusitis. • Indigestion and acidity: 2 table spoons of honey and a quarter teaspoon of cinnamon helps relieve stomach pain, indigestion and acidity. • Influenza: Scientists have proven that a mixture of honey and cinnamon helps to kill the flu virus. • Sore throat: A tea made from 1 table spoon of honey and 1 teaspoon of cinnamon sipped thrice a day is advantageous. • Toothache: A mixture of 1 teaspoon of cinnamon with 3 teaspoons of honey applied on the aching tooth 3 times a day would relieve the pain. • Fatigue: Senior citizens who take honey and cinnamon in equal parts are more active and flexible. • Weight loss: 1 teaspoon of cinnamon powder and 1 table spoon of honey boiled in 1 cup of water helps reduce weight as it reduces the accumulation of fat cells in the body. 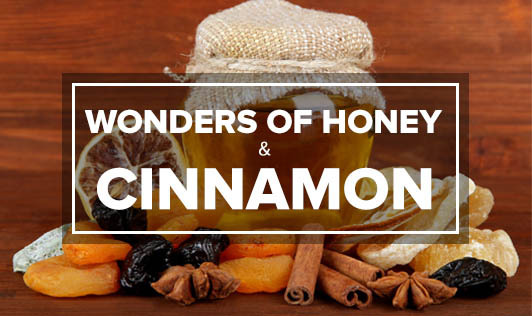 Using raw, unpasteurized honey and organically grown cinnamon shows better results. With modern day medicines having side effects, it is better to opt for home remedies with easily available ingredients from the kitchen.